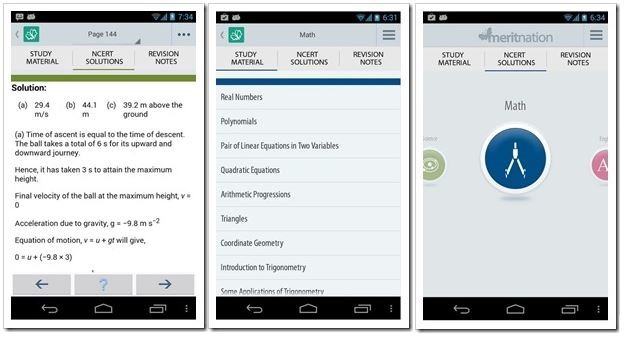 Meritnation Launches App That Makes K12 Studies Fun & Interactive! Just like our phones have become smart, education has also become smart. With the changing times and technology, learning-on-the-go is a new concept that has been fast gaining ground. So next time you see someone playing Subway Surfers or Candy Crush in the metro or local, you may also see someone studying using mobile some educational mobile app! Meritnation, India’s leading online K-12 education portal for students have now launched app that will make studying on mobile & tablets much more fun and interactive. Meritnation App has been launched on both Android and iOS platforms. Meritnation’s web portal already has a student base of over 40 lakh, catering to classes 1-12, with a vast repository of study material, videos, animations, interactive exercises and assessment-based learning. The same content is now available on this newly launched app. The educational content covers syllabus for CBSE, ICSE and state boards of Karnataka, Maharashtra, Kerala and Tamil Nadu – from classes 6th to 12th. We tried their Android app and it looks great. You need to login via FB or a via small form to fill in. It is there that you select which class you are in. Once the mere 9 MB app gets downloaded, you can see that everything inside is categorized into Study Material, NCERT Solutions and Revision notes – broadly, study, test and revise. The subjects cover Physics, Chemistry, Biology, Math, English, Hindi, Commerce, Vedic Math – every subject you will come across from 6th standard to the 12th. And you can change your class/standard even while browsing the app. One topic per subject is free to study and revise but for all others, you have to pay. For eg: Force, work, power and energy is a topic in Physics subject which is free to study (it has ‘n’ number of lessons inside every topic) but all others like Machines, Calorimetry, etc., you have to fork out money. Also, the UI is exactly like an ebook you read with proper graphics, illustrations and images. The best part is there are videos at the end of the topic too which can make students understand in a much better way! So once you are through with studying the particular topic, you can flip to the Revision Notes section and revise whatever you have studied – important points for every lesson is there in the form of bullet points, the way you would be taking down notes in a lecture session. And this is the real USP of the app, apart from the neat swipe-and-read manner. The app is an online app. Meaning, you need to be connected to the internet to read stuff which you reading for the first time or to see videos. Plus, to have access to all the subjects, you need to become a paid member and pay fees ranging from Rs. 2500 to Rs. 5500. To try out, students can use only 1 chapter of each subject, which in my view is very limiting. Rather they could have given time based full access, which would have allowed students to check out if everything they wanted was available. Right now there is no way of knowing it unless you become a paid member! Having said that, paying money for education or tuition fees is an investment rather an expense! And from the reviews given by the users, majority of them have found it very useful. Nearly three thousand out of four and half thousand ratings have been 5 stars on Google Play. We need more and more such companies to come up with educational apps. For every racing and shooting game if companies make one educational app, it would push the e-learning industry to new highs. The only challenge would be the niche audience who would play it. Gaana.com Acquires Musicfellas.com; Brings Independent Music On Its Platform! 5 Mobile Apps That Help You Go Green!